Now that the July evaluation period has come and passed for college coaches, it is time to move on to extending new scholarship offers and starting to secure commitments for the class of 2015. With several regional schools battling against each other for some of Ohio’s top prospects, the competition tends to get pretty intense. While another rising senior from the Buckeye State made a pledge to a mid-major school on Tuesday, the recruiting scene across the state has been frantic. 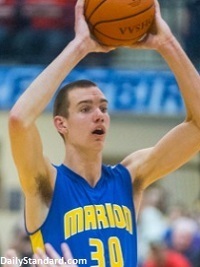 Here are some of the latest headlines in the recruiting world…..
• Luke Knapke – ’15 Marion Local PF/C: The 6’10 post out of Northwest Ohio chose the Toledo Rockets on Tuesday night, becoming the third Ohio prospect from the 2015 class to choose an in-state MAC School. Toledo head coach Todd Kowalczyk was the first D1 coach to offer Knapke over a year ago, and that early offer paid major dividends for the Rockets, when the skilled post from Marion Local committed to him this week. Knapke turned down offers from Akron, Wright State, Miami (OH), Kent State, Ball State and Northern Kentucky to choose Toledo; the closest of all the MAC schools to his home. Because he plays at an Ohio Division IV high school, and with a non-shoe company sponsored AAU team, Knapke isn’t really a well-known names to casual observers of the recruiting scene, however, the 6’10 post has a lot of upside and is a guy who mid-major coaches were really battling to sign in the 2015 class. • Grant Zawadski – ’15 Troy Christian PG: Another rising senior who has made a commitment, Zawadski spurned the advances of some of the region’s top D2 programs, choosing to commit to Indiana Wesleyan on Sunday. A well-known NAIA program, Indiana Wesleyan’s proximity to Troy will allow Zawadski to play close to his family and likely earn early playing time. In other Zawadski related news, the Troy Christian guard will also be working this fall to recover from a torn meniscus which will likely keep him out about three months. The point guard suffered this injury in the second of the three evaluation periods, almost two weeks ago. • Matt Moyer – ’16 Gahanna Lincoln PF: After securing several high major offers during the evaluation period, the rising junior from the Columbus area added another pair of high major scholarship opportunities this week. Both Illinois and Tennessee offered the athletic power forward, after both schools spent time watching him play with the VCC Ohio Warriors in Louisville last week. • Ibi Watson – ’16 Pickerington Central SG/SF: Watson added another mid-major scholarship offer to his list on Tuesday when Toledo made the call to the rising junior. Moving from Athens to the Columbus area for his junior season, expect Watson’s name to become bigger and bigger in Ohio recruiting circles, as the long wing combines a polished skill-set with a lot of athletic potential. • Xavier Simpson – ’16 Lima Senior PG: Simpson picked up his second high major offer on Tuesday, this one coming from Northwestern head coach Chris Collins. Joining Xavier, Toledo and Kent State on Simpson’s offer sheet, Northwestern is officially the first Big Ten school to offer a scholarship to Ohio’s top point guard from the 2016 class. • Willie Jackson – ’16 Cleveland Garfield Heights SF: After impressing Coach Larry Brown with his athleticism and effort in Louisville with the King James 16u team, the Cleveland area rising junior picked up an offer from the SMU Mustangs this week. Joining Iowa State as another high major who has made an offer to Jackson, college coaches appear to be very excited about Jackson’s athletic potential as a versatile combo forward. • Jason Carter – ’16 Johnstown Monroe SF/PF: One of the most talked about prospects in the region throughout the entire month of July, Carter earned the first of what we are assuming will be many mid-major offers when Ohio University officially extended a scholarship offer his way on Wednesday. With size, athleticism a skill-set and great potential, Carter is the ideal stretch forward in the MAC, and will likely be recruited heavily by all the in-state mid-majors. • Houston Smith – ’16 Columbus Africentric SF: After his supporting play helped All-Ohio Red’s 16u team advance to the finals in Louisville and the semifinals at the Nike Peach Jam, Smith was rewarded this week with his first D1 offer, from Bethune-Cookman. The Daytona Beach (FL) school has been well known for recruiting the Buckeye State, often being the first school to offer a prospect a scholarship. An athletic forward with good upside, Smith still has to continue to develop his skill-set, but he has a lot of potential in Ohio’s loaded 2016 class.